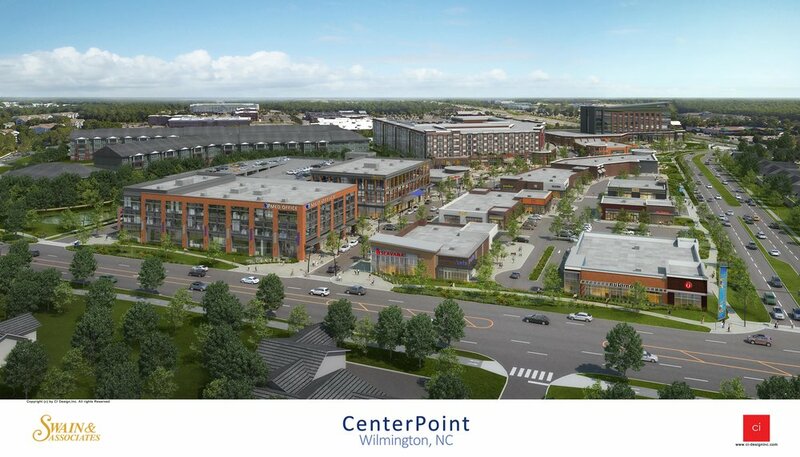 Developers shared the latest timelines and other details Tuesday morning for the more than half-a-billion dollars in major mixed-use projects they're planning in Wilmington. 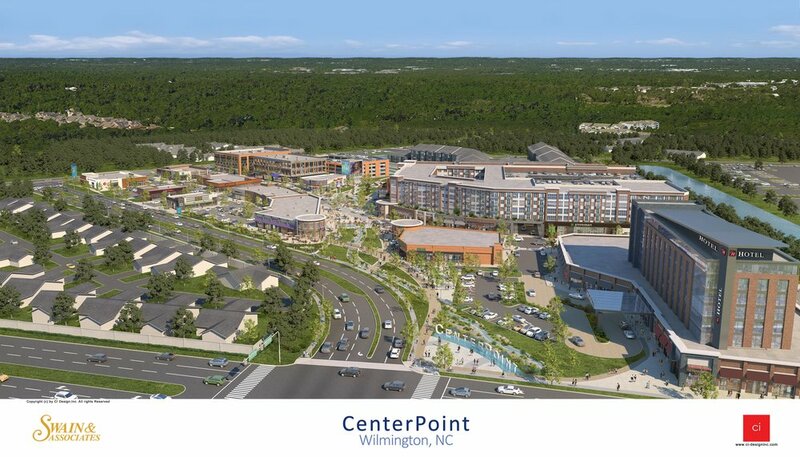 Over the next few years, they expect to break ground on two proposals along Military Cutoff Road in the Landfall/Mayfaire submarket and one in the works in downtown Wilmington. The planned projects are CenterPoint, a $250 million, 1-million-square-foot development at 1531 and 1541 Eastwood Road; The Avenue, a $200 million Westin Hotel-anchored proposal at 347 Military Cutoff Road; and River Place, an $83 million, 13-story downtown facility with condominiums, apartments, commercial space and a new parking deck. "Everything is already teed up and ready to go. We're now waiting for the Traffic Impact Analysis so the MPO and DOT can analyze it and review it and determine what they want to do with that intersection [of Military Cutoff and Eastwood roads]," said David Swain, owner of Swain & Associates, the Wilmington-based firm planning CenterPoint. Like The Avenue, CenterPoint would include a five-star hotel (as-yet-unnamed), along with apartments, retail space, parking decks, offices and more. Swain said he anticipates the TIA for CenterPoint being received Oct. 7, and expects it will take the Wilmington Urban Area Metropolitan Planning Organization (MPO) and the N.C. Department of Transportation (DOT) about 30 days to review it "to make their decision which direction they want to move." Of the options the transportation agencies have to consider, Swain said he's counting on the N.C. DOT choosing the extension of Drysdale Drive, a road out of the Landfall neighborhood, over a more expensive overpass. "When that determination is made, we will then go before the planning board [the Wilmington Planning Commission]. We anticipate that will probably be in December of this year. The planning board will make its review, and assuming that we get approval from the planning board, then we'll go to City Council probably in January or February of next year," Swain said. Swain was part of a panel with The Avenue developer Roy Carroll, president, founder and CEO of Greensboro-based The Carroll Companies, and Lucien Ellison, project manager for East West Partners, the Chapel Hill-based firm working with the city of Wilmington to redevelop the downtown Water Street parking deck into River Place. The three talked about their projects Tuesday morning during the Greater Wilmington Business Journal's Power Breakfast at the Wilmington Convention Center. In the case of River Place, the Water Street deck has yet to come down, despite a ceremonial groundbreaking in May to celebrate what was to be the defunct deck's upcoming demise. "We were hoping to have already started on the construction. It just hasn't happened. This project has been a bear. There's been numerous roadblocks that we have overcome, but we just have a few more to get out of the way, so we hope that we can start construction in mid-October," Ellison said. One of those roadblocks has included the need to revise the original purchase and development agreement made between the city and East West Partners two years ago because of rising construction costs. Ellison said once demolition begins, "it'll be about 22 months to total project build-out." For The Avenue, Roy Carroll said his company has assembled 44 acres off Military Cutoff Road. "We've closed on our property; we've engaged engineers, architects; we have a TIA. We're looking to go potentially to [City] Council sometime the first of next year," he said. "As far as breaking ground, I would say the earliest would be the first quarter of 2019." He said creating a mixed-use project can slow down and complicate the development process. The Carroll Companies is planning to build The Avenue in multiple phases, with construction on the Westin Hotel and conference center in the first phase. The development is also expected to include a world-class spa, 500 luxury apartments with an age-qualified component, and high-end boutiques under the apartments on a main thoroughfare, Carroll said. Asked about whether there's room for more retail in Wilmington, especially the Mayfaire area, panelists said they feel they can bring in the kind of shops and restaurants shoppers want. Swain pointed out that other shopping centers on Eastwood and Military Cutoff roads are full or nearly full with retail tenants, including Lumina Station, Lumina Commons, Landfall Center and The Forum. "I'm not concerned about the retail. We're looking for the smaller shops. We’re going to be dealing with people that are 2,000 to 7,000 square feet," Swain said. A 75,000-square-foot medical building planned at CenterPoint will likely feature a user, for example, that could cater to those with medical emergencies who would benefit from a facility within a 15-minute drive, Swain said. Carroll said The Avenue's boutique stores will be upscale. "We’re looking to go after the most high-end brands," he said. Ellison said nearly half of the 32,000 square feet of commercial space at River Place is accounted for, with tenants that include a fine-dining restaurant, fitness center and candy store. Addressing the issue of competition from online retailers, Swain said good retailers of all sizes have already embraced e-commerce and incorporated it into their businesses to thrive. At the same time, Swain & Associates is planning a unique feature for CenterPoint that anticipates a delivery method of the future -- a drone port on top of one of the buildings where items ordered online can be delivered. In response to a question about traffic in relation to The Avenue and CenterPoint, Swain and Carroll both said traffic plans in the future for Military Cutoff Road (including developer-planned improvements in the case of The Avenue and numerous entrances and exits at CenterPoint) should alleviate those concerns. Swain urged city officials to see past what he expects to be a relatively small group of naysayers to the future benefits the developments could have for Wilmington. "These are three dynamic projects. Raleigh, Charlotte, any community in this state would love to have any of these three projects . . . Let us move forward," Swain said. "Let us prove ourselves."